I will never forget it. I was in the third grade and I did not quite know what to think of it. I remember what felt like a long drive and wanting to hit the beach while we were there, but more than anything I remember the power, the sheer utter power. Endeavour’s mighty roar rocked my chest. My family and I were fortunate enough to have been able to watch Endeavor’s first launch from a special viewing area. The day that President Obama confirmed that the Space Shuttle program was being put to an end, I bawled. I have lived in Orlando my entire life. What would life be like without standing outside, head tilted up searching the skies for the bright orange glow and bold, puffy white trail? What would life be like without the heart stopping double sonic boom as the shuttle came home? Well it’s been a year and I will tell you…. it’s been quiet. Too quiet. I miss it more than my fingers can properly convey on this keyboard. 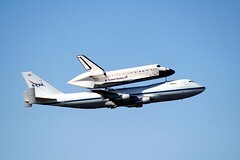 On Wednesday September 21, 2012, my favorite Space Shuttle will leave my homestate. It hurts. I will be getting ready for work while watching the final flight on TV. I hope that Endeavour will make a couple low flying trips along the coastline just like Atlantis did on its final flight. I love NASA, I love the former Space Shuttle program, it was Endeavour that drew me in. It was the first shuttle I saw lift off in person. I felt her force. It probably helps that I was at a very impressionable age, but the fact of the matter is it is my favorite shuttle. I was hoping that out of the three surviving shuttles, she would be the one to stay here in Florida. However, she is heading to sunny California,… which actually makes me happy…. kinda. California is my second home because of my husband. We visit Los Angeles, specifically the Disneyland area at least once a year. Endeavour will land at LAX just like husband and I do annually (although we prefer Orange County / John Wayne). The good news is Endeavour will find a new home at the California Science Center in Los Angeles. I hope to have a chance to visit her sometime. For now, I will enjoy the ability to head off to Kennedy Space Center from time to time to get inspired all over again, plus it helps to make a pit stop at Cocoa Beach for some much appreciated beach time. Farewell Endeavour, godspeed. Hi… it was great to meet you too. Yesterday was both fun but also exhausting. I feel like I am in recovery mode today. Thanks for stopping on by, I look forward to speaking you in the future.